Mimaki BS2 Ink can been printed directly onto most uncoated PVC and scrim banner media. It does not contain any dangerous solvents nor spread any any dangerous solvents (volatile organic compounds) into the working environment; it is proved to be the true environmental-friendly light solvent inks. 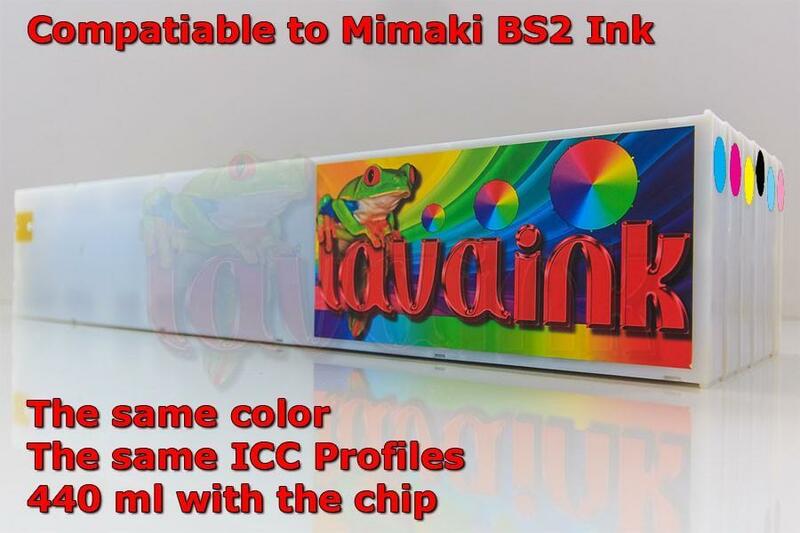 Lavaink is a leading global Solvent & Eco-Solvent Inks manufacturer especial for Mimaki BS2 Ink. We perfected OEM material and technology to produce outstanding inks over OEM Ink. We give our customers the lowest possible prices by selling Ink directly from us. No distributor means lower costs. You can count on us for great products. Mimaki JV3, Mimaki CJV30, Mimaki JV5 etc. LavaInk produces brilliant print result and durable graphics. Ink have been used in the industry and perform excellent both indoors and outdoors. it always meet its customers’ satisfaction at competitive prices. The World’s the Largest Manufacturer supplier the Best Quality Ink at Unbeatable Prices. LavaInk is made in Japan and sold to the end users directly. That’s why LavaInk could supply the highest quality Ink at the lowest prices. as low as 30% OEM ink price. No need to flush old ink before switching. When the device ready, PRESS KEY “END” 1 time. Choose and enter”Ink 1 parametre”. Exit and choose the ink type you want shows on the LCD. After been choosen, The device will advice you to insert the cartridges. Disregard it and shut down the device directly. RE-operate 1> …6> but this time change value “0” to “3”. After set, the device will ask you to insert the cartridges. How to enter technician mode? Turn down the front power. Press “<“, “>” at same time when power on. How to change ink type? After set, the device will ask you to choose a ink type when restart on LCD panel.